Are you ready to buy a hot tub or swim spa? It’s something that you’ve been thinking about for some time. You have been dreaming about turning your backyard into a welcome retreat, thinking about relaxing after a particularly stressful night. But a hot tub or swim spa is a big purchase, and you want to make sure you are not just investing in the dream but a quality product. It’s something that Master Spas wants for you, too. As you take the next steps, keep the following considerations in mind. Not only will you have the best hot tub or swim spa delivered to your home but you will feel confident throughout the process. How much space do I have available? Master Spas hot tubs come in a range of sizes — from cozy corner units to spacious spas that seat up to eight. A swim spa requires a larger footprint but Master Spas makes swim spas in a variety of sizes, from 11 feet long to 19 feet. Before you do anything else, determine how much space you would like to dedicate to the hot tub or swim spa. The Rule of 10. You will want your hot tub or swim spa no more than 10 paces from the access to your home. Anything farther has been shown to limit how often homeowners use their hot tub. All About That Base. Hot tubs and swim spas require a level surface that can withstand the weight of the unit filled with water. Be sure to account for at least two to four feet around the area of your hot tub. Power Up. The distance from electrical access is important, and you may need to contact an electrician before your hot tub or swim spa arrives. Who will be the primary users? Next you’ll need to determine who will use the hot tub most often, how many people will be using it at any given time and why they’ll be using the hot tub. Maybe you are looking for a place to exercise and unwind. If so, a swim spa will best fit your needs. If your purchase is motivated by relaxation and therapy needs, you might prefer a hot tub. Consider whether it will be just you and immediate family using the hot tub or whether you want to entertain. Families with children will also want to ask about safety features. When buying a hot tub, consider what features are important to you. You can choose to add BlueTooth speakers and Wi-Fi capabilities. From built-in luxuries to optional packages, a hot tub from Master Spas has a lot of features. There are jets, which deliver a custom massage; waterfalls and other water features, which add to the ambiance; and technology, such as music systems and Wi-Fi controls. Your future hot tub from Master Spas will have jets but the number will vary among models, as well as the arrangement and pattern. Consider where you will need the most relaxation. Do you spend your work day on your feet? A hot tub that has Master Blaster Foot Therapy will provide much-needed reflexology and relief. Will you be entertaining in the space with your hot tub? 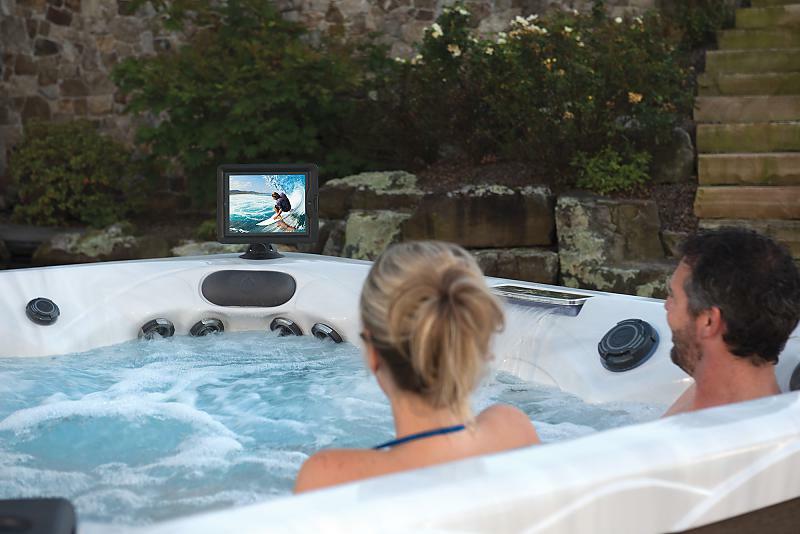 Look to add the Fusion Touch Sound System to your hot tub. Other features available for a Master Spas hot tub: lighting packages, water noise reduction system and upgraded water purification systems. You think you know what you want and where you want to put it. The next stop is the dealer. To make sure you are getting what you want, be prepared to ask the dealer questions about the product, delivery and installation, as well as maintenance. What does the cost of the hot tub or swim spa include (such as cover, accessories, chemicals, steps, etc.)? Does installation include delivery and set up? Do you do a site inspection, either before purchase or delivery? Do you offer the opportunity for me to try the hot tub in the showroom before I buy it? What is the warranty, and what is the process if I need to make a claim? What safety features are included or available? What plumbing, electrical or other contractors will I need for the installation of the hot tub or swim spa? What municipal codes need to be considered? What services do you offer after the sale? What instructions do you provide for water maintenance? What seasonal maintenance should I know about? Master Spas wants to make buying and owning a hot tub or swim spa as relaxing as using one. Going to your local Master Spas dealer prepared will help you feel confident — and relaxed.